Ads proclaiming, “Why believe in a god? Just be good for goodness’ sake,” will appear on Washington, D.C., buses starting next week and running through December. The American Humanist Association unveiled the provocative $40,000 holiday ad campaign Tuesday. . . . I just shake my head when I hear atheists using the word good. Who decides what good means in their worldview? If there is no absolute authority, then good is relative and can be defined anyway we decide—although with such a subjective definition, why should anyone else agree with our definition? In Matthew 19:16–17 we read about a man who came to Jesus and used the word good. Regardless of their obvious inconsistency in using the word good, secular humanists are providing just another example of how they are on the war-path in this country (and the U.K.)—they are becoming more blatant and more aggressive! This nation is changing dramatically. I have also included a photograph of myself–with my wife, Mally, along with Buddy and Kay Davis on the stage at the church where we conducted the AiG conference. 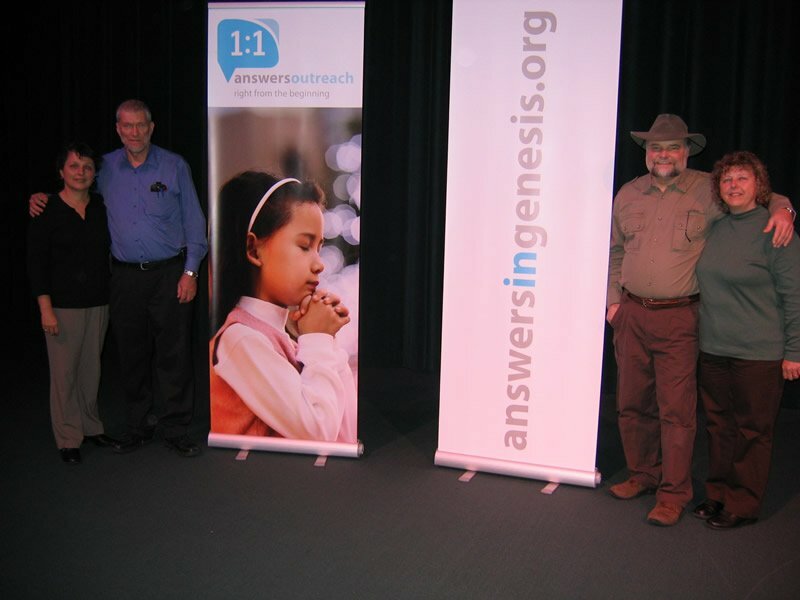 We are standing beside two of the new banners we are using as part of our outreach set up. (Hebrews 3:12–13) Take heed, brethren, lest there be in any of you an evil heart of unbelief, in departing from the living God. But exhort one another daily, while it is called To day; lest any of you be hardened through the deceitfulness of sin. The course downwards is always the same; to depart from Christ, the means is always to make sin appear attractive, and the goal is always to harden the heart.